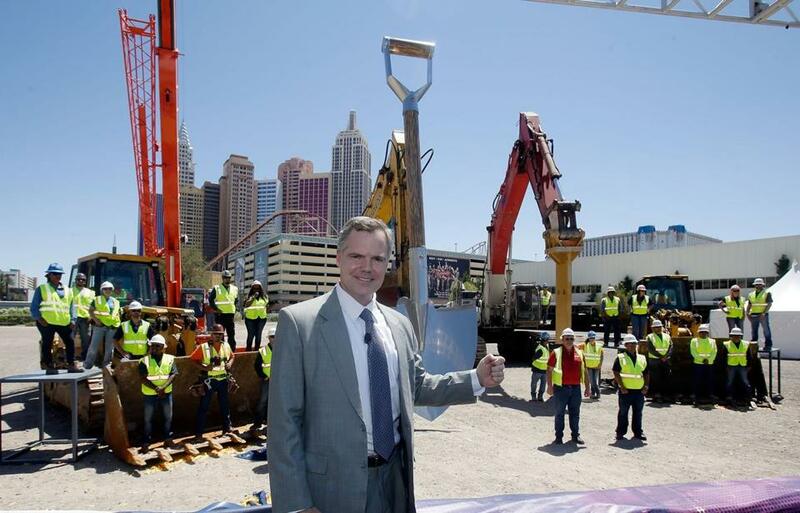 MGM Resorts International Chairman and CEO Jim Murren posed in May with a giant shovel and construction workers at a groundbreaking in Las Vegas. James J. Murren, chairman of the board and CEO of MGM Resorts International, is a great salesman for casinos, especially the one he wants to build in Springfield. Murren’s pitch is effective — just like the “Vote No on Question 3” advertising campaign that MGM and Penn National Gaming, which won the state’s slot parlor license, are helping to fund. I favor repeal, but so far, there’s no sign of a serious campaign to undercut the pro-casino tug at the heartstrings when Jeff Ciuffredo, the Springfield Chamber of Commerce spokesman featured in one of the pro-casino ads, asks voters to please vote no on Question 3 “and really help us save these 3,000 jobs that are coming to the City of Springfield.” What the ad doesn’t say is that if those 3,000 jobs actually do materialize, jobs will likely be lost somewhere else — such as nearby Connecticut. There are only so many gamblers to go around. “They will lose revenue,” acknowledged Murren, when asked what a successful Springfield casino would mean to competitors like Foxwoods and Mohegan Sun. But that doesn’t bother him, because, as he explains it, he cares so deeply about Massachusetts. Sullivan Square will be part of a looming tug of war over what the neighborhood will look like in the casino era. Are there danger signs from Atlantic City, where casinos are dying in batches? Not according to Murren. Those bankrupt casinos are the product of hubris and a corrupt political system that “completely ignored” the realities of the free market. He sees no connection between that and what’s happening in Massachusetts, where two casinos and a slots parlor are already in the pipeline and three men were recently indicted for lying about land in Everett that casino mogul Steve Wynn plans to develop. Murren’s also unconcerned about competition from Wynn’s $1.6 billion casino plan; nor worried about competition from nearby Albany where Murren fully expects another casino to sprout. He has every major promoter of aging rock stars on speed dial, he said, and will be able to snag big concerts and fights for currently downtrodden Springfield. According to a recent Boston Globe poll, only 40 percent of likely voters favor repeal of the casino law and 53 percent want to keep it. However, a recent WBUR poll put the “No” repeal vote ahead by only 49 to 44 percent. If accurate, a mere five-point edge is surprising, given the advertising silence from the other side. Casino opponents say they’re running a grass-roots campaign — another way of saying they lack money for ads. They recently produced a study that showed casinos will cost cities and towns more than $100 million a year, as gamblers spend less on the state Lottery. However, the mayors of Springfield, Everett, and Plainville, where a slots parlor is currently under construction, disputed those findings, as did state Treasurer Steve Grossman. 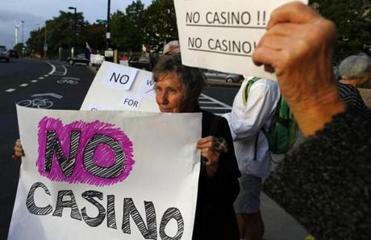 Casino opponents still hope to get out a core message via an advertising campaign. “We’re Don Quixote and we still believe we can win this,” said Harshbarger. But they can’t do it without money. That’s the real power behind the casino industry’s smooth and calculating pitch.